Carrying the right amount of camera equipment in a comfortable, accessible bag is an eternal problem for photographers, or at least for me. At this point, I’ve settled on a system of a technical hiking backpack with a camera insert for my longer landscape photography trips, but I haven’t yet found the perfect bag for more moderate travels. Enter the Peak Design 45L Travel backpack, advertised as Peak Design’s top travel bag. Does it fit the bill? 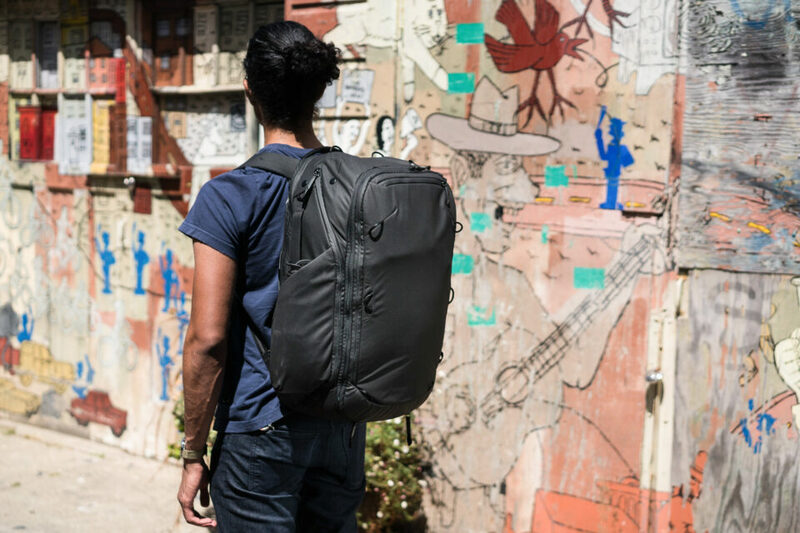 Note that the 45L Travel Backpack is currently on Kickstarter, with more than $4.7 million sold at the time of publishing this article – clearly a very popular bag! The campaign also ends in less than 24 hours (specifically 8 PM Eastern time on September 20), so if you want a copy of the backpack at its non-retail price of $235 versus the MSRP $300, now’s the time to order it. The 45L Travel Backpack is built with very impressive, high-quality materials and attention to detail – as well as excessive fabric and bulk, akin to what I found when I reviewed the Peak Design 20L Everyday Backpack last year. 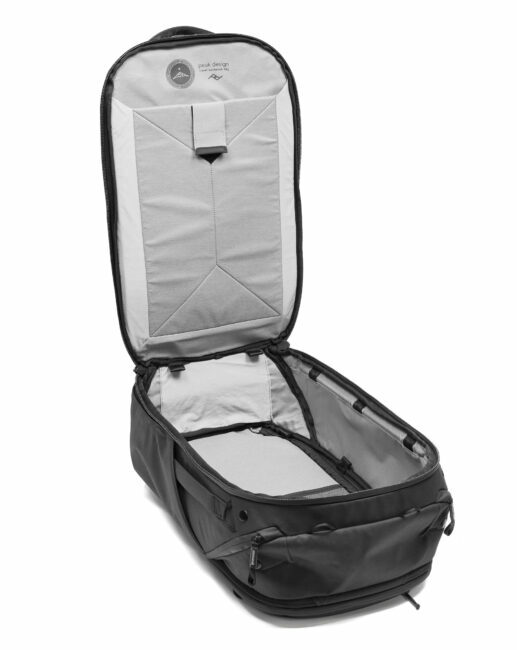 The back compartment of the 45L Travel – again, the part that touches your back – opens to allow gear access. Most likely, you would put a camera unit (Camera Cube) in that area to access your gear more easily. You’ll find that you can load the 45L Travel Backpack with enough camera equipment that it becomes too heavy well before the pack fills up. That’s not much of a negative, though – the bag is relatively comfortable overall – but is instead a statement on the 45 liter specification. It’s a large backpack, to the degree that most people will be better off with something in the 30 liter range instead, at least for a walk-around pack. It can be hard to tell the size just from the photos online, but it’s quite large indeed. Then again, if you need 45 liters, you need 45 liters. It’s a good size for carrying while you travel – it fits under typical airline seats, though barely – yet carries enough for any reasonable use. I’m going to Photography Life’s Jordan workshop in a couple weeks, and you can guess what backpack I’m taking along. Although Peak Design also sells a number of camera compartments (“Camera Cubes”) and other gear-holding pouches that work with the 45L Travel, they ranged from quite good to unnecessary. I loved the Shoe Pouch and Packing Cubes, but thought the Tech Pouch was bulky and over-engineered. Without a doubt, I’ll be using some of these pouches while I travel, but my recommendation is to buy the basic version of the 45L without any extras, then add your own instead. The Camera Cubes are how the 45L Travel Backpack holds your main camera kit, and I thought they were solid – akin to F-Stop Gear’s ICUs in terms of quality and weight. However, I still wouldn’t buy a copy of the 45L Travel which includes these Cubes, since there are other options on the market that are more streamlined and just as sturdy (specifically the Core Units from Shimoda). One problem that I have with Peak Design backpacks in general is that they are quite heavy for their size, eschewing minimalism in favor of aesthetics and clever design. As a result, they are some of the highest-featured backpacks on the market today, with interesting engineering elements and design choices that are, overall, quite impressive. But they are also bulky. The Travel Backpack is more streamlined than the Everyday 20L that I reviewed earlier, but it still has the same underlying DNA. The sides of the bag open in order to access the camera units inside, although this time the back compartment does as well. 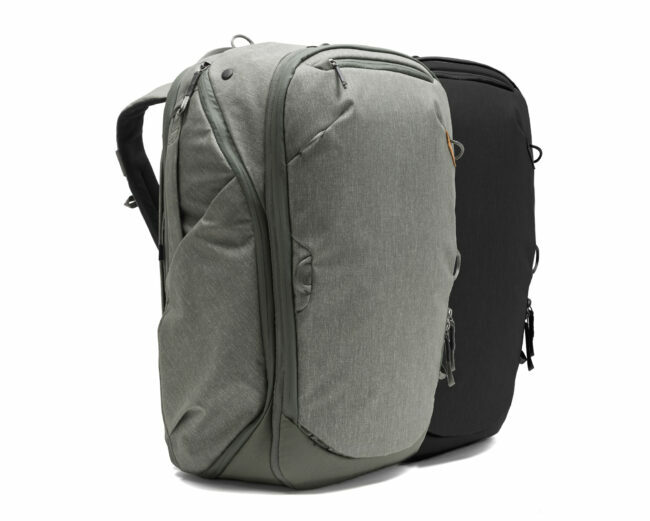 The 45L Travel also inherits some of the Everyday bag’s bulk, with especially the back panel being quite heavy and stiff. Although this arguably protects the laptop better than it would otherwise, it still felt excessive to me. Then again, how many backpacks out there have side access points as well as a rear panel access point? Same goes for the impressive number of zippered compartments and weatherproof design. Even little things like the magnetic connectors to stow away the hip belt are intriguing touches, and arguably would be impossible to include without the high amount of “extra” fabric in the bag’s design. And if you want a backpack that protects your gear well, the Travel 45L certainly will do it. Overall, my impression of the Travel Backpack is that it was a very usable and functional bag, particularly if the extra features matter to you. Peak Design has slimmed down certain elements, too, compared to the Everyday lineup, such as the side pockets that fold out. So, on balance, it does feel less dense and fabric-heavy than other products from the same company. I’ve spent so much time over the years with different backpacks, from cheap camera bags to high-end hiking packs, trying to find the most comfortable one for carrying heavy camera kits for a day or more of walking. An uncomfortable bag is one of the quickest ways to cause a headache, no matter how much or little camera gear you’re carrying. How does this bag stack up? Photographers moving from the world of typical camera backpacks will be very impressed by the comfort of the Peak Design 45L Travel. It is built for people to wear for long periods of time, not just to hold as much camera gear as possible for a given volume. On the other hand, photographers who are used to technical hiking backpacks will find the 45L Travel to be a step down in comfort, with much less breathability for your back, a relatively poor hip belt, and stiffer shoulder straps with minimal padding. Don’t get me wrong – this is a comfortable backpack. I’m still planning to use mine for travel photography both in cities and for moderate hikes, knowing that I won’t end the day with a painful back or shoulders. If you can’t say the same about your current photography backpack, and you like the features of the 45L Travel, it will be a noticeable step up in a number of ways. The 45L Travel is a well-balanced bag, good for some uses and overkill for others. If you’re the type of photographer who needs features like dual side access, back panel access, and a large number of zippered compartments, it could be ideal for your uses. On the other hand, if you’re after minimalism, the extra features of the 45L might be more trouble than they’re worth. Tons of features. Is it possible for that to be a bad thing? Yes, if it comes at the expense of bag weight or comfort. Even the Kickstarter campaign advertises “side handles, back handle, top handle, oh my!” They forgot the bottom handle as well – five in total. That’s a lot to handle. Allows back panel access. This is good because it’s one of the best ways to access gear in any backpack. It’s bad because it comes at the expense of breathability, as do all other bags I’ve tried with the same type of access (such as those from F-Stop Gear). Unexpected design choices. For example, there isn’t a single buckle on this backpack; straps attach via loops and hooks instead. I don’t consider that either good or bad, but it is unusual. Some will appreciate the clever engineering, and others will wonder why a backpack, of all things, has a learning curve. The 45L Travel Backpack is an excellent choice for photographers who need to carry a significant amount of gear while traveling, but not enough to necessitate a large hiking backpack. It’s already one of the most successful Kickstarters ever, so clearly there is an audience who feels that it’s ideal for them. In general, though, I would recommend that most photographers pick a backpack that is smaller and more compact overall, even something like the older Peak Design Everyday 30L Backpack. Or, if you need size like this, jump up to a hiking bag with a camera insert for maximum comfort and streamlined design. At a price of $235 on Kickstarter without any accessories ($300 once it goes for sale on peakdesign.com), the 45L Travel is not a cheap backpack – as you can tell not just with price, but also the superb build quality and interesting engineering it offers. Although this is a good bag overall, and ideal for certain uses, the price is high enough that I can’t recommend the 45L outright to typical photographers unless you know that its strengths will fit your needs. But if you do know that it’s a good choice for you, now’s the time to buy – the Kickstarter has less than 24 hours to go (ends at 8 PM Eastern time on September 20), after which the price of the bag will be $65 higher than it is now. Spencer Cox is a landscape and nature photographer who has gained international recognition and awards for his photography. He has been displayed in galleries worldwide, including the Smithsonian Museum of Natural History and exhibitions in London, Malta, Siena, and Beijing. To view more of his work, visit his website or follow him on Facebook and 500px. Read more about Spencer here. I love Peak Design gear and have lots of it. However, carrying that sort of weight I’d much rather use my F-Stop Lotus (32L) or Tilopa (50L). Far better load carrying, at the expense of a little bit of pretty. I remember comments about the Everyday backpack not really being set up to carry weght. This looks just as bad from the online pictures. This one was better than the Everyday bag in terms of comfort, at least for me, since the shoulder straps are positioned farther apart. The hip belt also is not great, but I’d rather have one than have nothing. That said, I wouldn’t want to carry more than 10-12 pounds / 4.5-5.5 kg of camera gear in this backpack, plus the weight of the bag itself. When I see the thin padding stingy straps my shoulders starts to complain. The missing ventilation on the back ensures a hot walk. Having a tripod on the side will eventually tilt the backpack on my back. But they are really good at marketing. And their camera strings are second to none. Having the tripod on the side is not something I would typically do – I much prefer to place it hanging from the back in the center. 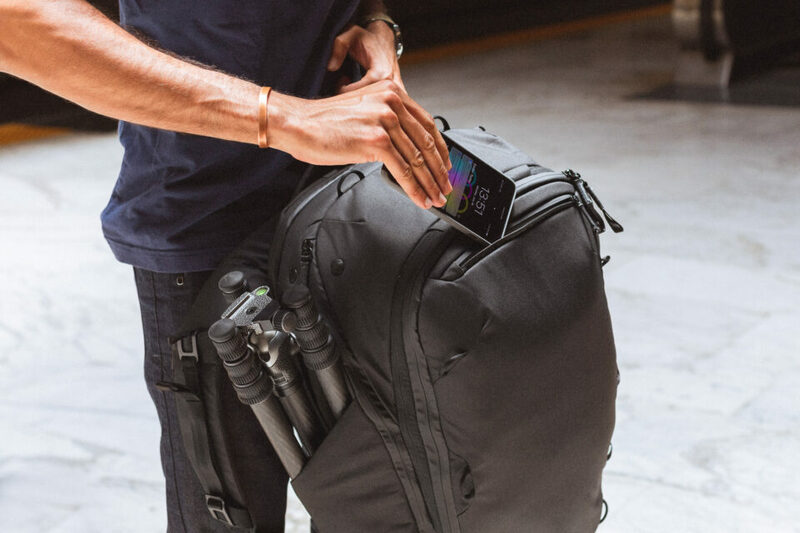 This backpack does offer a number of loops to attach the tripod that way. Although that setup results in a lot of weight hanging too far from my body, I still find it more comfortable than an imbalanced pack from side to side. You are spot on in terms of their marketing efforts! I am at the other extreme. I use very light and compact rig for my trips up the NM mountains and deserts. I use the smallest Peak Design sling 10L , carry only 1 nikon d5500 camera, only 2 lenses – 50mm 1.8 and Tamron megazoom. Also the smallest Manfrotto BeFree tripod with video head. Plus the usual: remote release, filters, sd cards, battery and charger, etc. 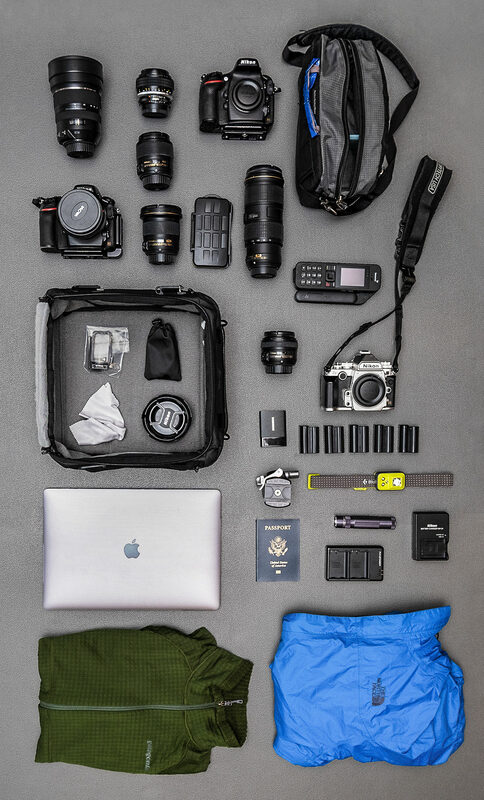 That’s a great travel kit – lightweight, streamlined, efficient. Reminds me how much my current landscape kit needs to be trimmed down! I tried f-Stop but didn’t do it for me. And Mindshift’s MP range of backpacks do not have access via the back (ie backflap) or top access. The best solution I have found are the Vanguard Sky Alta packs. Top and Back access! Give decent protection and they have the internal volume. But the internal dividers are not near the quality of the Origami Velcro dividers by PD (as judged by their Everyday packs). The lack of ancillary space is the big shortfall of these Vanguard backpacks. The side pockets are too tight and do not unzip sufficiently. They also have an external flap that covers a drone on the outside or folds out and down for a tripod attachment. But this feature is too specialized. It should have been augmented, to also serve as an outer pouch when needed. But the straps and belt on the 45D and 53 models must be the best I’ve tried out – YET – on any backpack. The two biggest in this range are the 32 liter [51D] and 34 liter  packs. They can carry a pile of photo gear, including the longest, widest telephoto lens + more. I monitored the kickstarter campaign of this bag closely with mixed feelings. The design seems to be aimed at maximizing sales at the expense of clear weaknesses… And there was a noticeable reticence to fix key weaknesses (eg ditching the means to carry bigger drones) and glossing over the thin straps. It seems the overriding aim is to attract other travellers besides photographers. The marketing pitch aims at the hipster cadre, One excuse was this bag is not a hiking backpack etc But what is the difference when one carries this pack all day sightseeing? Bottom line – the maximum capacity is 45 liters = serious weight! Besides the problems with the straps is the singular failure in the Camera Cubes. They are just that much too shallow. 2 reasons – one is packing flexibility. Those of us who have to carry the widest telephotos – ie 600 f4E Nikkor at 160mm min diameter (actually it is wider with hood reversed – ditto for 400 f2.8). The Cube is just too shallow. The Large Cube should be at 190mm deep AT LEAST. The mistake PD made in their research is to assume most travellers fit the trendy mode, and that many do not carry big telephotos. Wrong! Consider the air travellers to S America, Asia and Africa – safaris or birding trips. These must be significant market in their own right – let alone WITHIN Europe or N America. Birding Tours and private trips are the one fast growing arena where the older clients do not stint on gear and they are the purchasers seeking solutions that combine capacity and flexibility with ergonomics. This PD pack is already expensive BEFORE adding the packing cubes. And we now are learning bad news from independent reviewers in a critical character of a backpack….. that the straps and belt on the PD Travel backpack are too thin. The straps and belt could have been improved. The company sure has more than enough funds to do so! These failures now hit honest reviewers right between the eyes. Well too late now for those of us who have paid. Shimoda and f-Stop also make their biggest cubes too shallow to protect costly telephotos. Another huge advantage to a cube/bag of approx. 200mm internal depth is it allows you to pack key medium lenses standing up. This is better in key respects of protection, besides saved space. So there’s a clear niche for a manufacturer to put out a camera cube that is deep enough. All the better if they give photographers an excellent feature of the Peakdesign packs – the Origami Velcro Dividers. In the interim the only solution is to modify an existing PD cubes (or Shimoda or f-Stop cubes) to add the extra depth. In summary, I aim to use the Travel Backpack for airtravel (with deepened cube) but the Vanguard Sky Alta 45D or 53 will remain my first choices for working packs. The 45D is ideal for a landscape kit with the 53 for wildlife or sports (packing a big telephoto). Glad you liked the review! I think you’re right, Peak Design is going after more than just photographers with this bag. The lack of options to carry telephoto lenses or larger drones can turn away some buyers, no doubt. Thanks for the recommendation on the Vanguard bags – those sound like good options for carrying larger camera kits. They have a video where they fit a Canon 400 f/2.8 in the large cube with a bit of a bulge – youtu.be/dWIfM…Ioc?t=2644 but I fully expect it’ll fit just fine in the backpack with extra padding. By the same token, you can always add a larger camera unit from companies like F-Stop Gear – the inside space of the 45L Travel is large enough to fit significantly more than just Peak Design’s Camera Cube. Thanks. Yes I watched those videos. I think the one with the 400 f2.8 Canon is in their shambolic video about camera cubes that did PD no favours! Irritating to see them try and dodge the obvious problem, as wide big telephoto does NOT fit with due protection in their big camera cube. Period. The packpack has more than sufficient depth to handle a 200mm deep Cube but they dodged the obvious…. Oh well, seen that and moved along….to make a plan! They also took the decision to drop support to carry a large drone in the Large cube – guess some see this as a deal breaker. PD have designed a bag of up to 45 l capacity but dropped the ball in dealing with the obvious inevitabilities. Especially at the price… Some of us will load the bag full and heavy ie to its capacity. Videographers and other pros etc…. many of whom share the common challenge to get valuable gear into a airplane cabin. Again, this is why this backpack still needs a decent hipbelt. PD brag on about the ergonomics of their articulating belt on this pack, but then emasculate the final product of padding?! Resale value is another very good reason to put your HK-38 carbon-fibre Nikkor lens-hood into safe storage is to preserve its quality! In any case, the replacement OEM part is one hell of a price (a crisp US$1079) ! My big gripe about camera backpack day bags is the lack of a place to secure a water bottle, difficulty of fitting your lunch and where to waterproofs once they are wet (after the rain has stopped. That is why I used a day walking bag with the inserts from my camera.